Nice crising boat SMOOTH RIDE along the way. 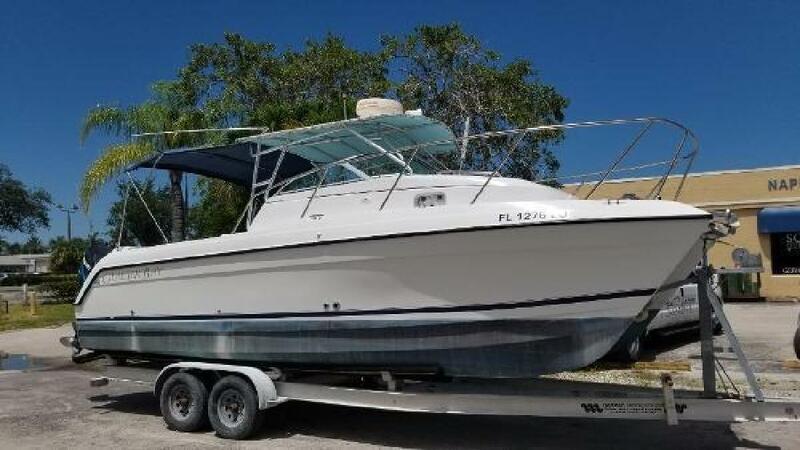 - LOADED Ready for weekend cruising or just hanging out fishing,grilling and chilling .Raymarine gps, Raymarine depth finder Simrad auto pilot, vhf radio, Spot light, Electronic controls, 1/2 Tower, enclosure,electric head, Rocket launchers,windlass,S/S PROPS,Twin 2002 150 Mercury Optimax motors, Nice cabin, queen berth,electric head ,sink and shower,Big aft cockpit, big storage, great riding one owner boat. Picture is on a trailer that is a shop trailer does not come with boat.